Areva and KazAtomProm have today signed a new strategic agreement to strengthen their cooperation in Kazakhstan's uranium mining sector. The agreement opens new opportunities to develop and enhance their long-standing Katco joint venture. The agreement was signed in Astana by KazAtomProm chairman Askar Zhumagaliyev and Areva CEO Phillippe Knoche. 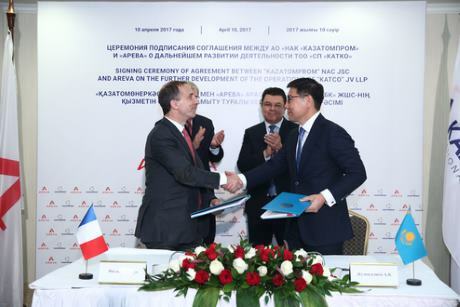 According to the two companies, the agreement "meets [the] interests of Kazakhstan and France, opens new opportunities for further development and enhancement of effective operations" for the 51% Areva-49% KazAtomProm joint venture. Katco, established in 1996, produces uranium at Moyinkum (Moinkum) in the South Kazakhstan region. A strategic agreement signed by the partners in 2008 expanded the joint venture from mining 1500 tU to 4000 tU per year. Knoche said the new agreement would give the joint venture a new long-term perspective, with the development of the South Tortkuduk project. This, he said, would extend production for the next two decades. "In the [framework] of longstanding nuclear cooperation between Kazakhstan and France, this agreement strengthens our 20-year partnership with KazAtomProm for the mutually economic benefit of the two partners," he said. Zhumagaliyev said the agreement was a "positive example of mutually beneficial cooperation in the successful implementation of joint projects in the nuclear fuel cycle". He said the provisions of the agreement corresponded to targets set by the Kazakh president, Nultan Nazarbayev, "to preserve leadership in the uranium mining market and to create a competitive nuclear company". Kazakhstan has been the world's leading producer of uranium since 2009. Its uranium mining operations are either wholly owned by state-run company KazAtomProm or operated through joint ventures between KazAtomProm with international partners. Earlier this year KazAtomProm announced the country plans to produce 10% less uranium in 2017 than it had previously planned, in response to ongoing oversupply in the uranium market. The reduction of 2000 tU is roughly equivalent to 3% of total global uranium production based on 2015 figures. Kazakhstan's 2015 production of 23,800 tU accounted for 39% of world production.